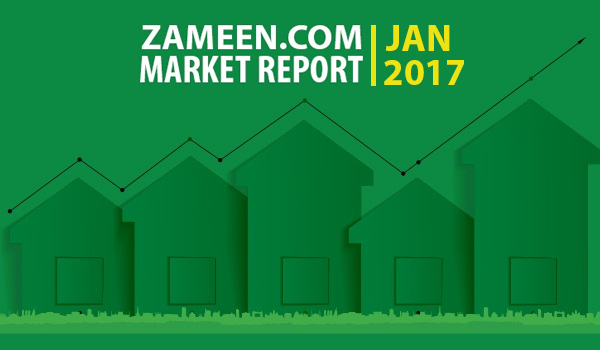 The start of 2017 saw unique trends for the property sector in Pakistan. Each city had an altogether different scenario to report, and the first month of 2017 was therefore essentially a mixed plate. 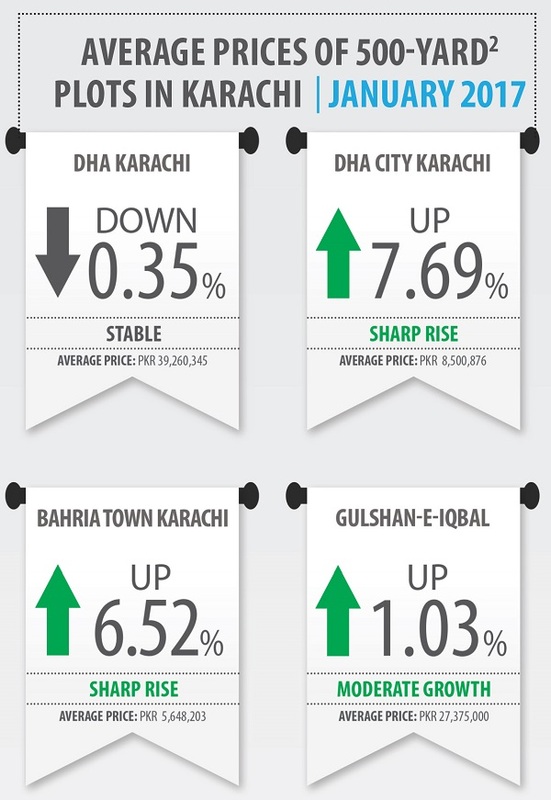 According to the data maintained by Zameen.com, prices showed highs, lows and stability differently depending on the city in question. While Lahore experienced either stability or moderate growth, Islamabad was a little more complicated with drops in some places and growth in others. 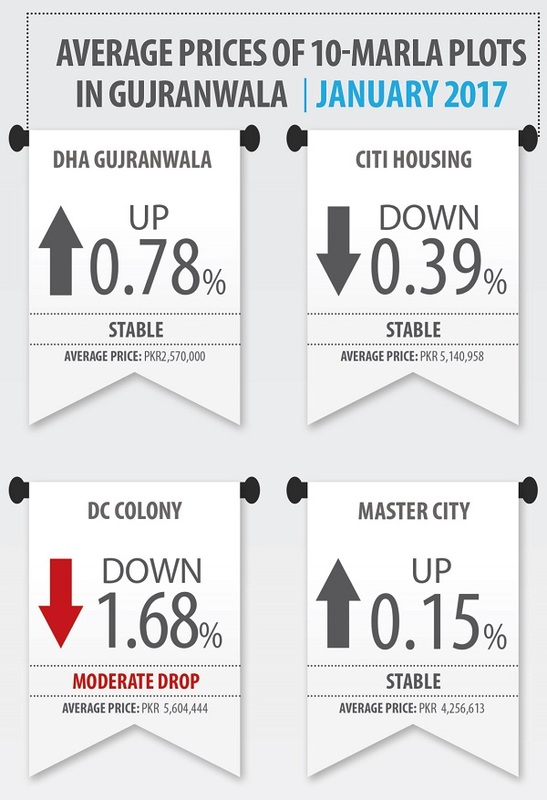 Karachi’s real estate market showed substantial jumps and Gujranwala’s property sector mostly experienced stability. In case of Lahore’s realty market, saturated residential areas such as DHA Lahore’s Phases I to VI, Bahria Town and Wapda Town continued to show stability. Meanwhile, societies such as Bahria Orchard, DHA Lahore’s Phases VII to IX, and LDA Avenue I seemed to be catching investor interest and experienced moderate growth. The trend indicates growing investor confidence in these localities. Islamabad’s real estate scene doesn’t seem to be faring all too well, however. 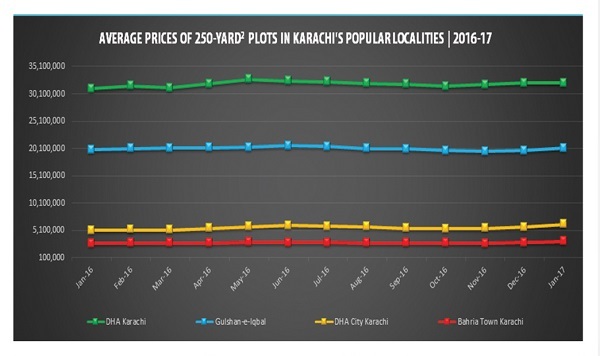 The city registered moderate drops in the prices of 10-marla plots in almost all localities except Gulberg Residencia, which saw a sharp rise of 6.08%. Even 1-kanal plots in Gulberg Residencia saw moderate growth of 4.82%. 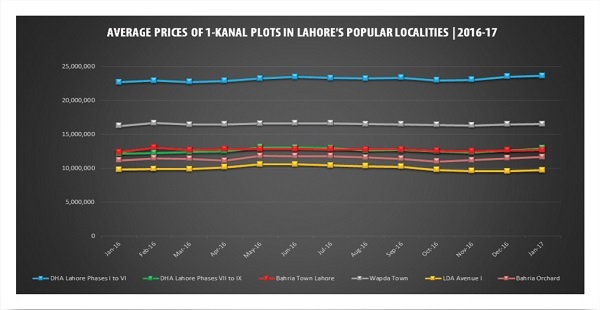 Meanwhile, other localities offering 1-kanal plots for sale either saw moderate growths or drops, or remained stable. 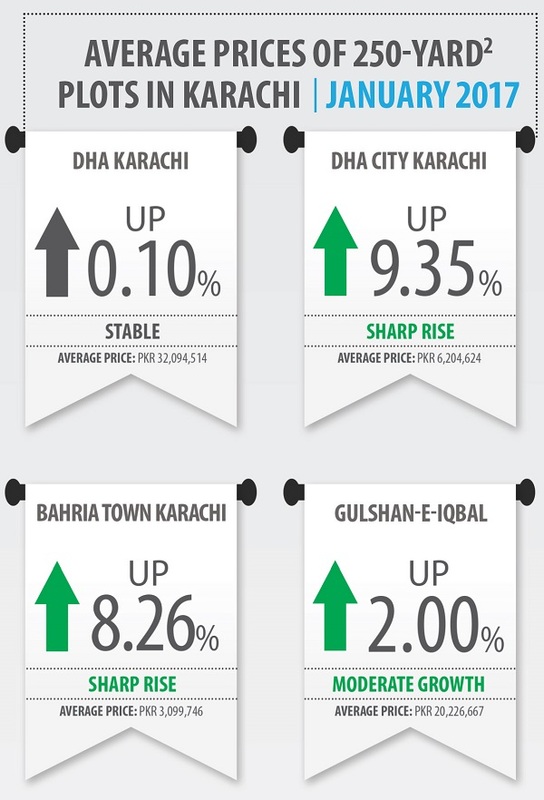 Karachi seems to have had a good first month with sharp rises in both Bahria Town Karachi (BTK) and DHA City Karachi (DCK). 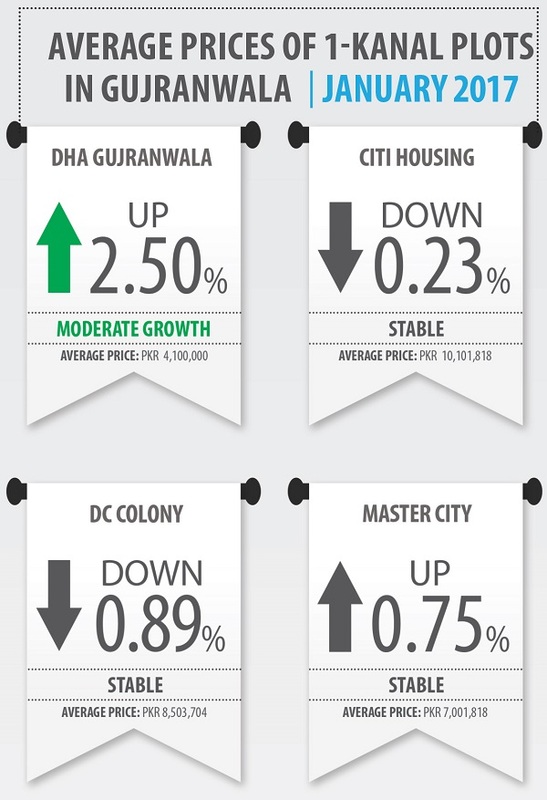 Even Gulshan-e-Iqbal, a highly saturated area, registered moderate growth. 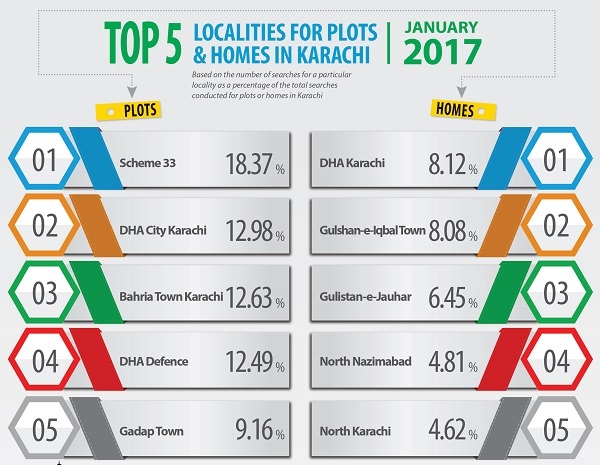 DHA Karachi experienced stability for both 1-kanal and 10-marla plots. Gujranwala is slowly turning into an investor favourite. 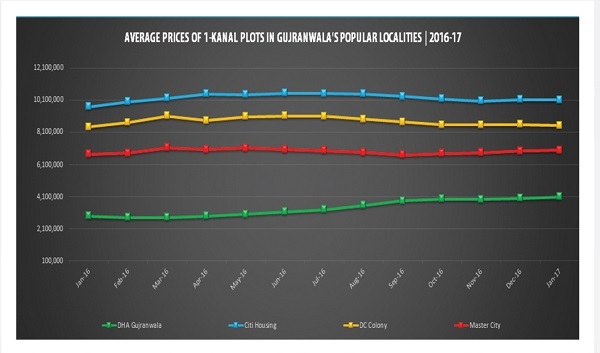 DHA Gujranwala experienced moderate growth for 1-kanal plot files, and remained stable for 10-marla plot files. 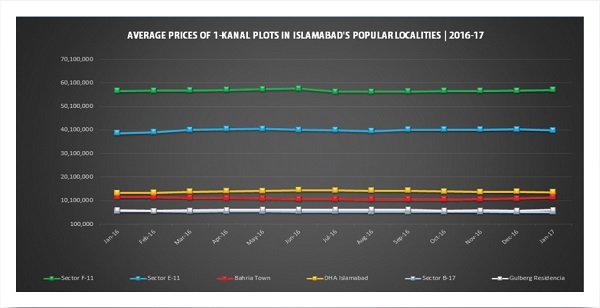 Other societies remained stable, while DC Colony saw a moderate drop for both 1-kanal and 10-marla plots. The year started with no significant elements to report for Lahore. Overall, major properties in the city either experienced moderate growth, or remained stable in terms of prices. 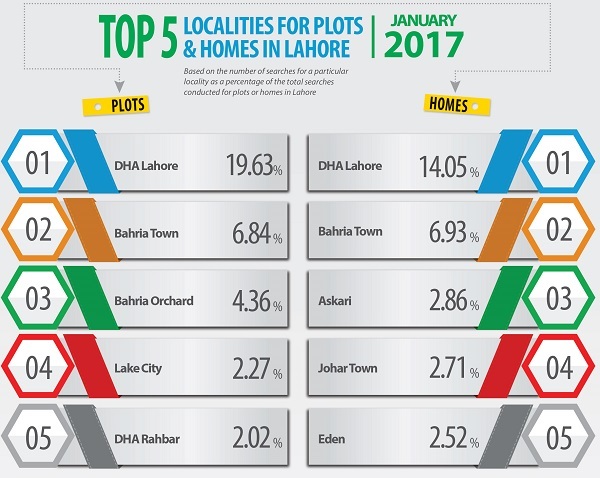 DHA Lahore’s Phases I to VI did not experience any massive change; however, DHA Lahore’s Phases VII to IX saw an upward trend. Wapda Town also exhibited stability. 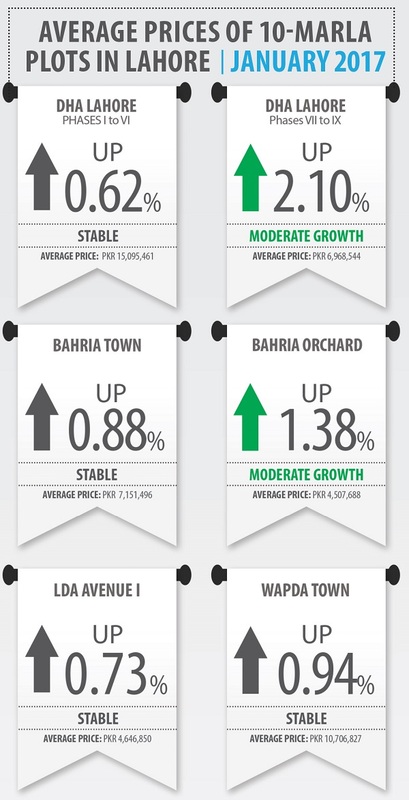 Bahria Town managed to more or less maintain prices despite the Lahore Ring Road issue, and LDA Avenue I is seeing moderate growth in spite of its litigation issues. 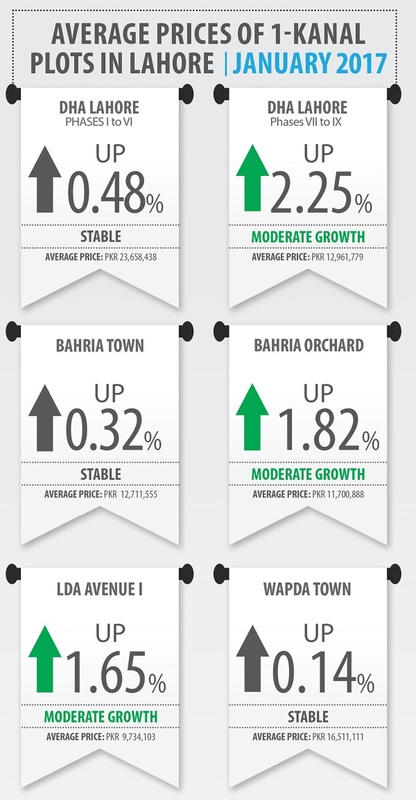 Bahria Orchard is slowly turning into a hot choice for investors, which is marked through the 1.82% growth in 1-kanal plot prices, and 1.38% growth for 10-marla plots. We expect the prices to continue on this upward trend. Islamabad’s real estate market isn’t having a great time, with most localities still feeling the pinch of the tax changes that hit the market last year. 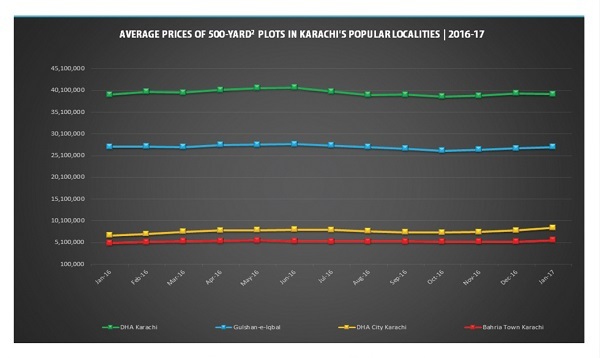 The exceptions are Bahria Town, which registered a very decent growth of 4.95% for 1-kanal plots and a sharp 6.10% rise for 10-marla plots, and Gulberg Residencia, which registered a growth of 4.82% for 1-kanal plots and 6.08% for 10-marla plots. 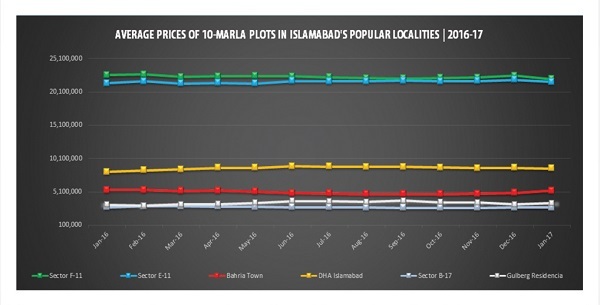 Sector F-11, DHA Islamabad, Sector E-11 and Sector B-17 all registered moderate drops in 10-marla plot prices. 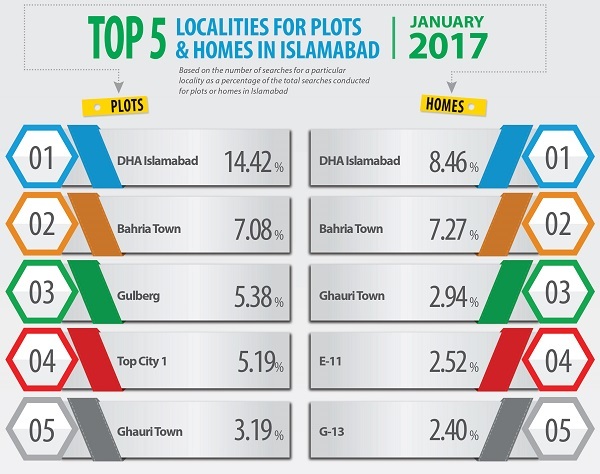 DHA Islamabad and Sector E-11 registered moderate drops for 1-kanal plots as well, while Sector B-17 and Sector F-11 remained stable. 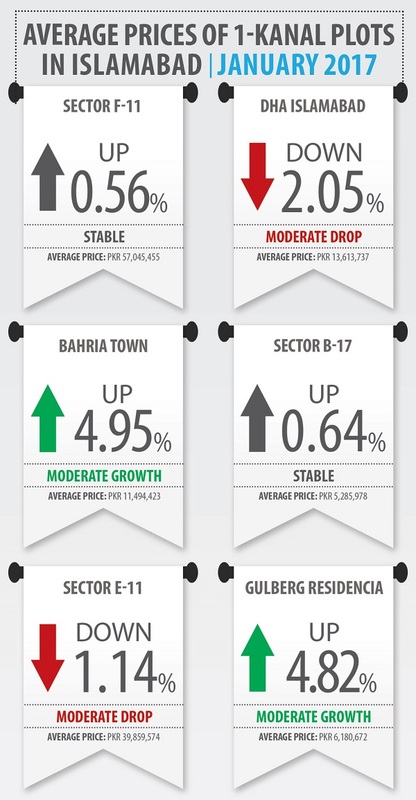 January was a good month for Karachi’s property sector. The city registered sharp rises in DCK and BTK for both 500-yard2 and 250-yard2 plots. Buying and selling activity has jumped with sharp rises in prices of plots in both localities. Gulshan-e-Iqbal performed well with moderate growth in both 500-yard2 and 250-yard2 plots. 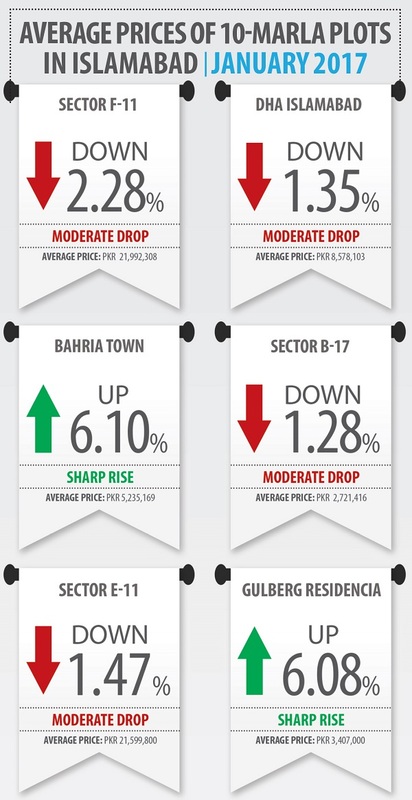 DHA Karachi’s saturation levels, however, have only managed to keep property prices stable here. 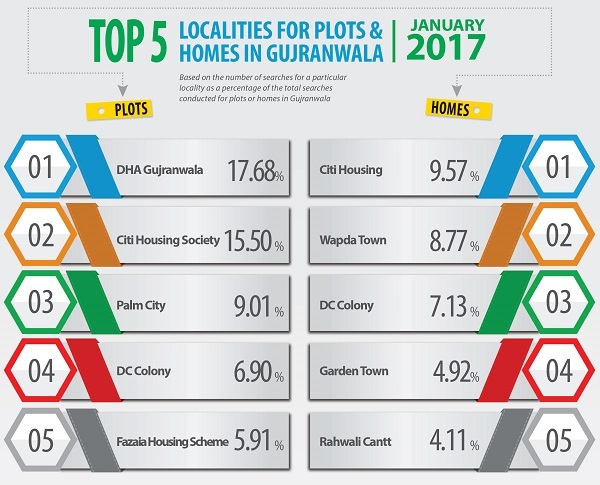 While Gujranwala has started to capture investor attention, in January its property prices remained largely stable. 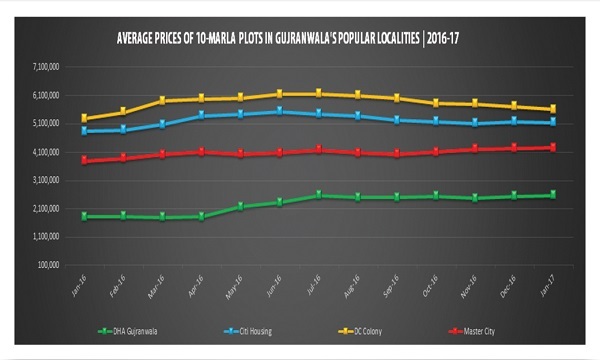 DHA Gujranwala saw moderate growth in the prices of 1-kanal plot files, whereas stability was the order of day for 10-marla plot files. Citi Housing remained stable for 1-kanal and 10-marla plots. 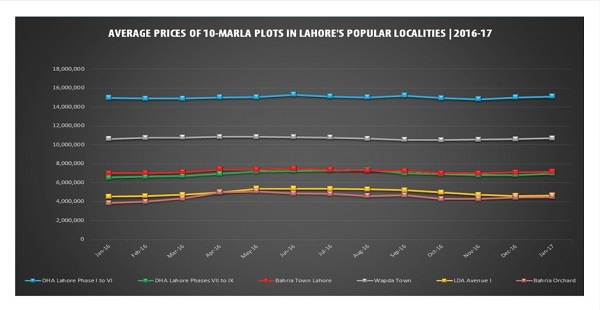 Even in Master City, plot prices clung on stability during the month. DC Colony saw moderate drops overall. This is largely because the property here is priced higher than other options, naturally diverting investor attention away. The real estate market is recovering from the tax debacle that deeply affected the second half of 2016. Despite the improvements, things are nowhere near how they used to be before the implementation of the new tax regime. Evidence of this are the largely stable property markets of Lahore and Gujranwala. As compared to other cities, Islamabad has not bounced back. However, this does not mean that the market holds no potential anymore. “There are some important developments happening in Islamabad. The market may seem stagnant but once projects, such as the Islamabad Expressway and the New Islamabad International Airport are near completion, activity should pick up pace again,” said Zameen.com CEO Zeeshan Ali Khan. Karachi has set itself apart with sharp growth being seen in upcoming housing societies, such as DCK and BTK. “We are expecting the market activity to pick up soon. While the tax scheme did take its toll last year, the amnesty scheme seems to be helping the market come back to its original state and absorb this change. The situation will improve in the days to come,” Khan added.